We environmentalists and urbanists know better than to deride density (and are often all too ready to proclaim so). Density is what makes the vitality of places possible, along with lowering eco impact. There’s no way I’d trade my rather tight NYC apartment for a bigger spread that required owning a car to visit a friend or buy groceries. And while I could see myself enjoying a small garden out back, I surely don’t miss mowing a three-quarter acre lawn. But on the other hand, I also wouldn’t trade my low-rise urban digs for a cookie cutter place in a modern tower, no matter who the starchitect was and no matter how much better the view was than the sliver of sky I can see from my third-floor walkup. Even if it had the coolest new and energy-saving appliances. Why, you ask? (At least I hope you’re asking. Unless, that is, you already know.) I love my block of walkups where I know everyone in my 12-unit building and many of my neighbors; where I know most of the store and restaurant owners. I can’t walk my dog without bumping into a familiar face. Now I realize that’s not for everyone. There are plenty of people who prefer their privacy, and for them a secluded country house sounds ideal. But the current movement to cities, and the accompanying diminished growth rate of the suburbs – while it hasn’t yet quite reached the level of suburban flight – indicate that the trend in the 21st century will likely be different from the second half of the 20th. And that’s all for the good, environmentally speaking. Though there are issues, such as the transport in of food and transport out of garbage, city living has a lower per-person ecofootprint due to decreased use of cars and smaller living spaces, which are often stacked vertically, thus saving land, materials, and heating and cooling impacts. My NYC ecofootprint is half the average American’s. 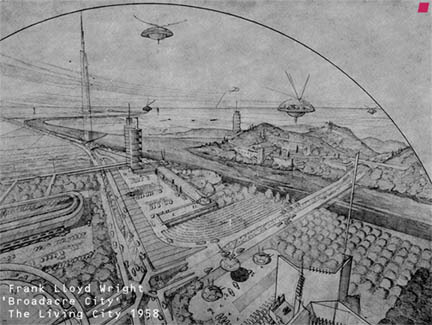 Many architects have tried to realize this conclusion, ranging from the late Paolo Soleri ‘s relatively earthbound Arcosanti to the more conflicted Frank Lloyd Wright, who evolved from the explicit sprawl of Broadacre City to the mind boggling (as well as budget- and structure-challenged) Mile High Tower. Which leads us to a modern interpretation called Sky City. Where Wright’s vision never made it much past the sketch stage and Arcosanti is far from complete after decades of construction, Sky City is on the fast –and I mean really fast — track to surpassing the world’s current tallest building, the 2,717-feet high 160-story Burj Khalifa. 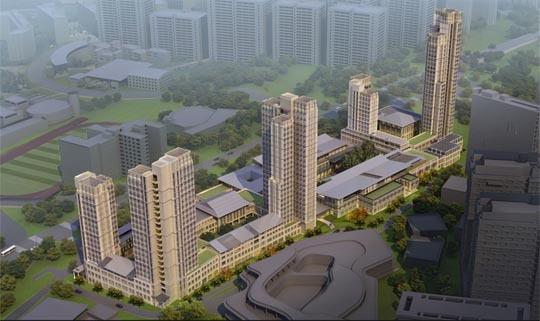 The pre-fabricated building, located in a small Chinese city, is set to break ground and will supposedly take a mere six months to construct its 220 stories reaching a height of 2,749 feet. 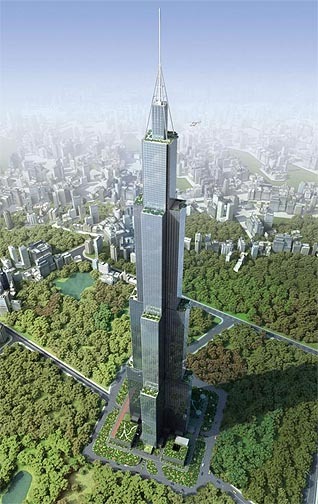 The rationale for the building, which is not connected to any street grid and resides basically in a field that is nine times the size of its actual footprint, is that it’s a highly efficient use of a dwindling supply of land, and that vertical transportation (that is, by elevator) is much more efficient than horizontal. Was this a true arcology, a self-sufficient city, that might be correct. Yes, alongside its 10,000 inhabitants, it will contain many of the elements of self-sufficiency: shops, schools, athletic facilities and even vertical gardens. But self-sufficient it isn’t. Notably lacking is places of employment, particularly offices and manufacturing. Schools, hospitals and offices comprise a mere 10% of its total space. That means most of its residents will be commuting to jobs outside the tower. It’s more than a little difficult to imagine the vertical and horizontal rush hours. Can a city (or streets) be vertical? That isn’t my biggest issue with the concept, though. My concern comes back to the reason I wouldn’t move from my street of 100-year-old walkups to this environmental high achiever. It’s about community. As I discussed in an earlier post, community is an essential part of human dwelling as both an end goal and as a means to creating “ownership” or buy-in of environmental issues. When you feel part of a community, you also become a stakeholder in its local environment and then, by extension, in larger eco issues generally. Can community be achieved in a building housing 4450 families, especially when that building, from the outside, appears as an undifferentiated and seemingly infinite stack of identical windows that could contain anything from apartments to offices to classrooms? That’s not quite a fair criticism in that there is a lot going on inside the tower. The floors are not disconnected from one another and accessible only via the detaching experience of elevators as most buildings are. Instead the core, up to the 170th floor, is tied together with a six mile long ramp which is dotted with courtyards for athletic and social activities. That could help create local neighborhoods within the continuum, but my suspicion is it still won’t really result in any sense of belongingness; one could be anywhere in the tower and not identify with a subset of the 220-story whole. Living in Sky City will be not much different from the anonymity engendered in typical, less lofty residential towers where the only meeting places are in the enforced brevity of elevators and perhaps the laundry room, if the building has one. Though the interior inclined street is an attempt to recreate the vitality of streetscapes such as those found in older cities, for a number of reasons it will fall far short of those urban ideals. 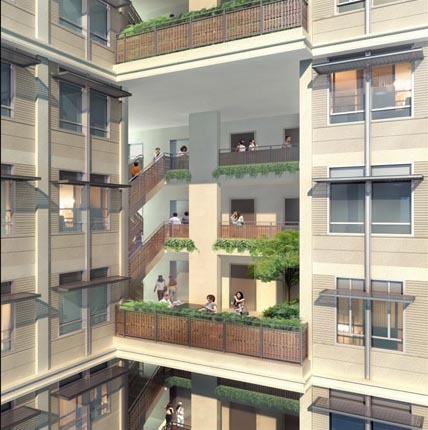 To address the issue of undifferentiated vertical stacks of dorms, according to Pelli Clarke Pelli, “Tower floors are grouped into neighborhoods around skygardens.” Their description continues “The tower designs and those of the courtyards, dining halls, and common rooms will differ in each residential college.” That should go a long way toward creating individual characters for each of the colleges, much more so that the homogeneity of Sky City, but still I wonder if the mere insertion of the sky gardens every so often will truly break the towers into neighborhoods. So what IS the right density? Treehugger editor Lloyd Alter has written about the “Goldilocks density,” describing it as “Not Too High, Not Too Low, But Just Right.” His focus there is not on the social advantages of density, but on energy consumption which, it turns out is more related to walkability than height. 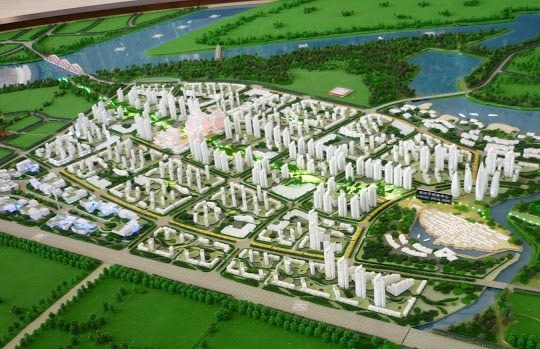 It’s disconcerting then to see the plans for what The Atlantic Cities calls “China’s most promising eco-city,” which, as it happens, is a joint venture with Singapore. 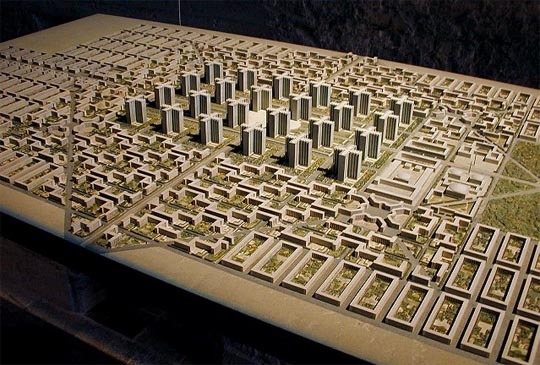 Among Tianjin Eco-City’s environmental claims are “90 percent ‘green trips’ via walking, biking, electric vehicles and streetcars powered by renewable energy.” But judging by the photos of the model, it looks much more like a realization of LeCorbusier’s Plan Voisin; its rigid composition of mid- and high-rise towers resembles Co-op City or the infamous Pruitt Igoe more than Greenwich Village or Paris. The towers appear to be completely disconnected from any street grid and, more importantly perhaps, completely disconnected from each other. It’s hard to imagine anyone walking to a supermarket or a drugstore. When you can’t distinguish one building from another because they are identical slabs arranged in some geometry that happened to look organized on paper, and when you can’t easily walk or bike to stores, schools or workplaces, there will be very little sense of identity to one’s neighborhood and, I’ll venture to guess, not nearly the degree of “green transportation” the designers and developers claim. The density of Tianjin Eco-City may lead some designers to expect that people will walk rather than drive, but walkability isn’t about just proximity, just as community isn’t about density. It’s not only about walking, but about what you experience while walking. Steve Mouzon calls this “walk appeal” to distinguish it from walkability. 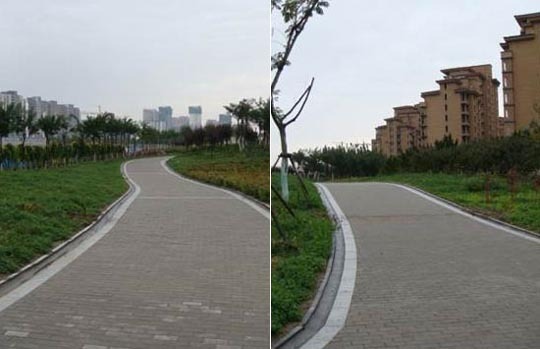 From what is discernible in the photos, Tianjin’s walk appeal looks to be nil. None of this is exactly breaking news. More than 50 years ago, Jane Jacobs talked about the importance of street life and the perils of high density. But the contemporary question is: how to interpret Jacobs for a world that needs — and a market that demands — higher density? And the answer is not all that elusive. One is found in the fact that the densest cities are often not those with the highest towers. 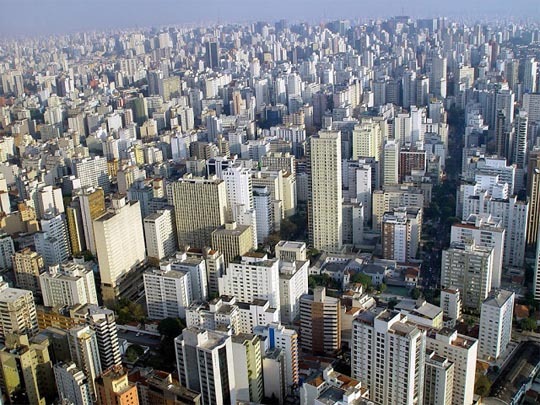 Los Angeles has a higher density (people per square mile) than New York does. Many of the densest cities are unfamiliar names in places like Indonesia and India. (Though some of these data are a quirk of how cities’ boundaries are determined.) This tells us that building ever higher is not inevitable and that, even though Sky City’s density, by itself, is off the charts, a city of Sky Cities – for a variety of reasons — would no more be the answer than would an expanse like the Los Angeles valley. Another answer may be in the imagery, some fantastical in the best sense and some dystopic, found in science fiction books and movies – images of continuous (but not homogeneous) urban fabrics, alive with activity. We have ready-made answers available, as Lloyd Alter points out, in the likes of Paris or Amsterdam or small and medium size American cities (provided they aren’t of recent car-centric vintage and you don’t include their surrounding suburbs in the model). These are both dense and “livable.” They are set up for walking and biking, and do not require driving. They may or may not be large enough or dense enough to support subways, but that diversity of size is a good thing; not everyone wants to live in cities where the population climbs into the six, seven or eight digits. And for those who can’t bear even smaller populations, there should be ample space left over. This entry was posted in Architecture, Community, Policy, Urbanism and tagged density, Frank Lloyd Wright, Jane Jacobs, Le Corbusier, Lloyd Alter, Pelli Clarke Pelli, Steve Mouzon on June 3, 2013 by David Bergman. What’s an architect to do? Some not-so-startling news – at least to those of us directly affected – was released last week by the American Institute of Architects. The gist of the sobering report: architectural firm billings have dropped 40% since 2008 and more than 28% of positions have disappeared. I brought this up in my return visit on Curtis B. Wayne’s radio show “Burning Down the House” this past Sunday (archived here) in which we were discussing ecodesign and economics. While our larger topics concerned the origins of suburban sprawl and how that subsequently became the “American Way of Life,” I used those statistics as a segue to talk about what it is that architects and other designers can or should be doing in a future that is likely to preclude making things – buildings and objects – on the same material scale as in the previous century. On the face of it, there’s a conflict of interest in a designer advocating a less materialistic world. Are we, in effect, talking ourselves out of jobs? (You know, the jobs that don’t exist in the first place….) Certainly we have to spurn McMansion commissions, or at least urge our less eco-minded clients to adhere to the advice Sarah Susanka provides in the Not So Big House. And it’s rather hard to justify designing yet another chair or teapot when the world is not exactly lacking in those. But – and here comes the EcoOptimist’s sunny side of the storm – architects and designers are particularly well suited to the imminent task of advocating for and persuasively cajoling us into the “better place” that can be the outcome of our dual eco crises. As I’ve mentioned previously, designers are, virtually by definition, optimists; “Designers look at a thing or a problem and immediately start imagining what could be.” And as my blog’s alter ego might say, “problems, have we got problems.” So that optimism has plenty of targets to address. Designers, obviously, also have to be visionaries. How else to see to possibilities amidst the economic and ecological rubble? Or to envision potential utopias where others fear post-apocalyptic dystopia? Accompanying that, most designers have the ability, developed through years of sometimes contentious client and public agency meetings, to communicate their visions. (One hopes, of course, that they are not so good at communicating that they are able to white- or green-wash a less than visionary idea. I’m looking at you, Le Corbusier and Frank Lloyd Wright. Plan Voisin and Broadacre City, as enticing as they may have looked at the time, did not help.) Environmentalism and ecodesign have long-standing PR and image problems, with most people connoting the movements with personal sacrifice. Designers, working in teams with others as they often do in their projects, can both devise positive solutions and create imagery that allows the public to envision how our lives would be affected. Here, then, is the upside of that AIA survey. Yes, conventional building and object design, along with their attendant jobs, are going away. That’s a good thing in terms of environmental solutions. Turns out it’s also a good thing for architects and designers, as well as the world at large, in that their abilities can provide a much-needed service as we all search for and develop those solutions. A post in The Atlantic Cities about the AIA survey asks: “Where are all the out-of-work architects going? Possibly to jobs in real estate and city government. And that could be good news for everyone.” In past recessions, architects, especially recent grads, have often found their careers re-routed. Coincidentally, a few years back, the AIA embarked on an initiative to encourage architects to run for public office, observing “architects learn creative problem solving and other skills that can make them effective community leaders.” The emphasis there is on architects’ strengths in listening and consensus building. Fair enough and important enough, but the potential goes beyond that I think, to employing those multidisciplinary, generalist skills mentioned above into a – and I use the word hesitantly – holistic synthesis. So designers have both an opportunity and a responsibility to redirect their talents. For reasons of both necessity and choice, we designers need to apply ourselves to developing and communicating our constructed futures. We need the work, and it’s good work to be doing. This entry was posted in Architecture, Economics, Role of designers, Uncategorized and tagged Curtis B. Wayne, Frank Lloyd Wright, Le Corbusier, materialism on September 26, 2012 by David Bergman.